Our family is in full-on Olympic mode. We’ve allotted a bit of time each evening to watch some of the events together as a family. We recently scrolled through a list of the events, and the boys were shocked to see medal bearing competitions in badminton, trampoline, and ping-pong…I mean table tennis. We decided to take a quick peek at the table tennis and badminton events. The boys remarked at how silly they thought these competitions were. “Why in the world would anyone want to make ping pong so competitive (and funny to watch)? Look at how serious they are! Mom, they are sweating…they are sweating playing ping-pong!,” they exclaimed. This made me chuckle. This statement was coming from a group of boys that makes even the most mundane activity into a competitive sport. Like who could throw a frisbee over the roof of the house or who could mow the lawn the fastest or who could register the fastest bike speed on the street’s digital speed limit sign. Anything and everything usually turns into a competition in my house. As silly as some of these events may appear to us, it reaffirms to me the competitive spirit that is stored up within each of us. Whether you are an athlete, a musician, a writer, a hunter, a hiker, a fisherman, an artist, a cook, or an entrepreneur, we are wired to strive. There is one guarantee in competition: someone will win, and someone will lose. There’s no way around it. When my children were young I noticed an alarming trend beginning. There were no winners or losers in competition. Whether you finished first or last, everyone was a winner just for trying. We live in a “Trophies for Everyone” society. A society that wants to insulate our youth from the negative feelings associated with losing. What a great disservice this thinking is doing to our youth. One of the greatest motivators in life is losing. Just listen to some of our Olympic athletes talk about how past failures have pushed them to work harder and set new goals. One day our children will be the adults of the world. They will experience disappointment and defeat, and no one will be there to give them a ribbon or shiny trophy just for trying. There will be promotions that slip away. Quotas that are not met. Elections that are lost. The list can go on and on. They must know how to deal with failure. They must be taught how to take that loss and use it for the good. Whether you are taking a test or taking part in a competition, you must go into the event prepared. This requires consistent, dedicated work before the actual event. Your input directly correlates to your output. Basically, what you put in is usually what you will get out. Allow yourself to experience the thrill of victory but do not deny yourself feeling the agony of defeat should that be the outcome. Be a good sport in winning and losing. Congratulate others. Have a moment. If you need to cry…cry. If you need to sit quietly…do it. Allow yourself to process. When losing comes do not brush it off, do not pretend that it is not there, do not store up your feelings inside. Deal with it and then let it go. Use it for motivation. Use it as inspiration. Above all else do not let winning or losing define who you are. Take time to evaluate. Is there something that I could have done differently? These are not revolutionary ideas. They are common sense ideas. Don’t get me wrong, instilling these ideas is not always easy. All of my children react to winning and losing in their own way. One is a bit too casual, one gets it pretty well, and one, well, let’s just say, we’re still working on it. If you are going to try to win, you must be willing to lose as well. A few short months ago I launched this humble blog. It was, and still is, my hope to share my heart. While I have had no difficulty in stringing words together as they relate to food, recipes, and competitive cooking, I have strained and struggled to compose entries relating to family life. It’s not as if I am at a loss for words. My head is spinning with topics and personal stories to share. My next blog post has been sitting in my draft folder for nearly two weeks, yet I simply can’t hit the publish tab. Why? Last night that question was answered. Talking about food is safe. No offense to all the wonderful bloggers out there, but me writing about food is not going to change the world. Oh, it can certainly enhance your life. It can encourage you to spend time cooking wholesome, homemade meals. It can assist you in dealing with food challenges such as allergies and the like. It’s a great arena to encourage the exchange of wonderful ideas. But in the end, if you made my recipe for Italian Meatball Soup, you may have enjoyed a yummy meal, but you likely didn’t have an epiphany or life-changing moment. Food is safe. The reason I have procrastinated in finishing my post is because I feel the weight of responsibility upon me. If someone is going to tackle matters of a personal nature such as marriage, parenting, and the Christian walk, one had better prayerfully consider the words they choose to pen. People, most of whom I do not know, will read these posts. They may contemplate the words they’ve read. They may examine themselves. They may be moved to tears, moved to laughter, or moved to change. If I write something misleading or wrong, I am accountable for that. That is heavy! I asked myself, “Who am I to write about these topics?” I am certainly not a professional. I’m not a Bible scholar. My life is not a glittering example of a woman who has always made the right choices. I still have my own struggles that I have to lay down at the foot of the cross each and every day. I am in the midst of seeking wisdom myself. I’m a lump of clay, gold in the process of being refined, a work in progress. As I write this I am reminded of my first day of seventh grade. I vividly remember sitting in my homeroom, my nervous fingers running across my red binder, a red binder that read, “Be patient. God isn’t finished with me yet.” Part of me laments that maybe I haven’t come too far since middle school because there is still so much the Lord is working on. Then the “more mature me” realizes that that quote should be my anthem, for God is not finished with me yet. 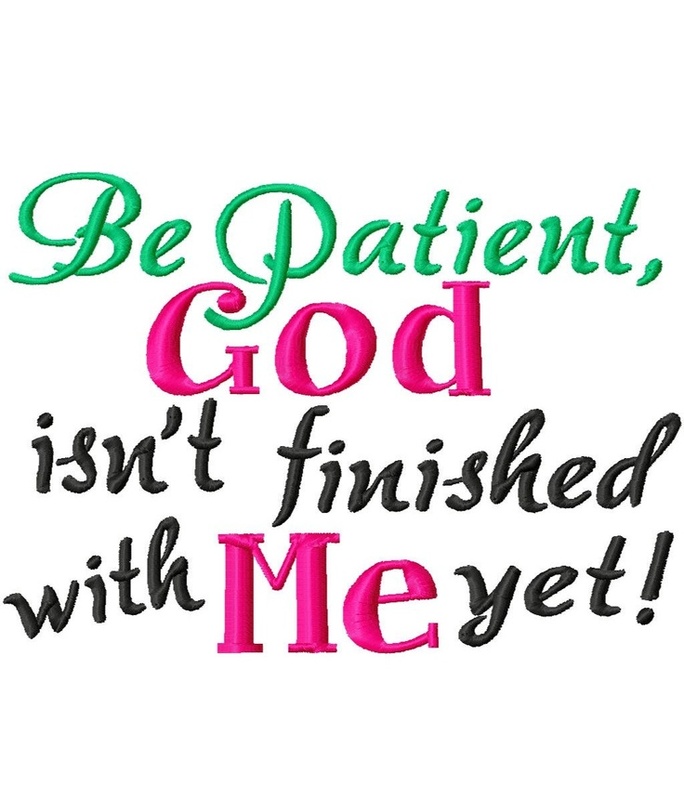 Praise God He’s not finished with me yet. So, as author of this blog, I am officially providing you with this disclaimer: I am no expert. I’m a wife trying to support, love, and encourage her husband. I am honored to share life with this man whom I adore and call my best friend. However, I know there are times that I fail. I’m a mom of three boys (two of whom are teenagers…pray for me). I’m trying to guide them, encourage them, and show them what it means to be a man according to God’s Word. Sometimes I fail. I’m a child of God. I’m still in awe of God’s love for me. I am so undeserving of it but so thankful for it. I try to be Christlike, but I fail…big time. I’m here to share my journey, to share lessons learned (some the hard way), and to share hope. I’m here to be transparent, brutally honest, and blunt. I’m here to simply write the words that Lord lays on my heart so that He may touch yours. Ahhh! That’s a big sigh of relief. Now you know who I am. So there you have it, read on at your own risk! Next post: Are you the perfect parent?